A comprehensive 1/35th scale update set designed by Rob Tearle for the Trumpeter Challenger-2 kits (00308, 00323 & 00345). The set includes many replacement detail items, brass skirting and mudflap set, new gun, commanders sight, smoke dischargers, gpmg cupola and mounting and many other correction and replacement parts. 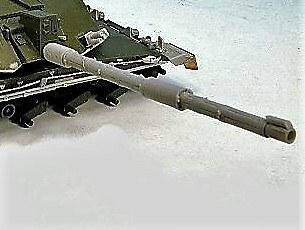 A 1/35th scale replacement fine detailed resin British Challenger 2 120mm L30 High Pressure MRS gun tube with thermal sleeving. This product was designed for the Trumpeter Challenger 2 MBT Kits but could be adapted for the Tamiya Kit.